Are you in one of the flooded areas? Share photos, video with CNN. Please don't do anything that could put you at risk. Teresopolis, Brazil (CNN) -- It was like a tsunami from the sky in Brazil's Rio de Janeiro state as floodwater gushed through hill towns and giant boulders catapulted from hillsides, instantly crushing cars and houses. At least 540 people have been killed and another 10,000 people living in what used to be picturesque mountain towns popular with tourists have been affected by the torrential rains that began at the start of the year, civil defense authorities told the official Agencia Brasil news agency. Rescuers have not been able to reach some hard-hit areas and many more people are feared dead, the agency said. Conditions were so treacherous that rescue teams called it quits Thursday night and resumed their search and recovery work Friday morning. The rain is predicted to continue for several days in areas already submerged in water or slathered with mud. Thousands of families are still living on mountain slopes or on riverbanks and face extreme risk of being washed away. One resident described the disaster as a tsunami that fell from the sky. Chaos reigned in the especially hard-hit city of Teresopolis, where some residents donned masks and helped clean streets or deliver first aid. Others combed the city, searching desperately for missing loved ones. Schools and police stations turned into overflowing morgues, where people waited to identify their family and friends. Municipal worker Reginald de Oliveira came to see if he could find the body of his uncle, missing in the floods. He was trying to save his family when a wall of water washed him away. Red Cross volunteer Maria Helena de Jesus was helping with first aid. "You have to almost have a heart of stone," she said. "It was very difficult." Teresopolis Mayor Jorge Mario Sedlacek declared his city a natural disaster area. At least 229 people died in Teresopolis, while 246 were killed in the town of Nova Friburgo, Agencia Brasil reported. President Dilma Rousseff flew over flood-affected areas Thursday and landed in a slushy, trash-littered soccer field in Friburgo, the agency said. The floods are her first test as president. She trudged through mud in her rain boots to talk to residents in a neighborhood where four of seven firefighters attempting to rescue people had been buried under mud. Three others were pulled out alive. "We are going to take firm action," to help the devastated areas, said Rousseff, who assumed office at the first of the year. Brazilian authorities have been criticized for a lack of disaster planning and allowing people to build homes in areas known to become treacherous in the rainy season. They are under increasing pressure to show a strong response. Brazil is scheduled to host the World Cup in 2014 and the 2016 Olympics. The roofs of houses and treetops peeked out from the water. People used inflatable rafts or inner tubes to navigate submerged roads. One family sat perched on the roof of their house, their predicament broadcast on television. Another person grasped onto a rope, defying, at least momentarily, the force of an ocean of murky brown water. With more rain forecast, Brazilian authorities have ordered evacuations for at least 5,000 families living in especially perilous areas in Rio de Janeiro state, Agencia Brasil said. Another 3,000 families from a mountainous region were homeless and sheltered in schools and gymnasiums, the news agency said. "The most important thing right now is to assist the homeless population and reach the most critical points," said Rodrigo Neves, the state secretary of Social Welfare and Human Rights. State health officials pleaded for people to donate blood that will be sent to the Serrana region, where only 36 units of blood remained for treatment of flood victims. 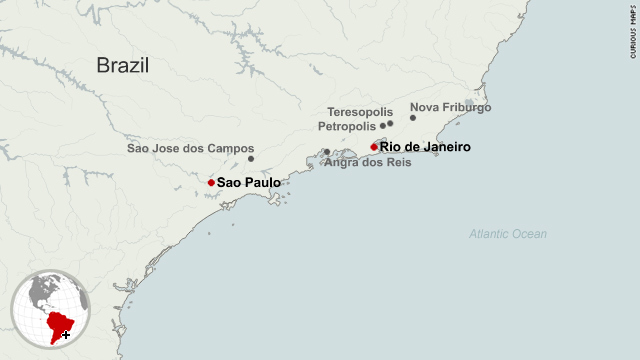 Rain has affected neighboring Sao Paulo as well, killing 24 people there, authorities said. Journalists Fabiana Frayssinet and Helena DeMoura contributed to this report.